If you're like us, you probably have a long, accomplished history of using spray cans full of different things to make stuff easier. Spray cans have been helping people style their hair, paint things quickly and evenly, and eat space-age cheese for decades. And the possibilities just keep growing. If you have ever been painting something with fake blood using a brush or your hands, and have thought to yourself that it just didn't have the natural bloody-spray look you were hoping for, technology has finally caught up with you. 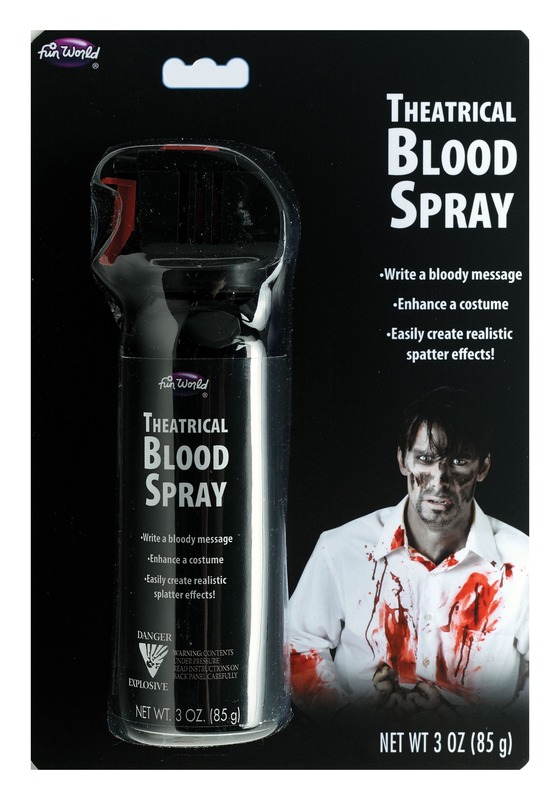 With this Aerosol Blood Writer, you'll be able to decorate your spooky Halloween scenes with naturally looking splatters of blood, and with the modern convenience of a spray can. Since this is fake theater blood, you can also use it to quickly add some gory accents to your horrific costume. Your only limit is your bloody imagination! Was sent wrong product, and without a nozzle to spray! I ordered this, and was sent a different can, with a red cap, and NO NOZZLE!!! I can't believe that one! Nothing. Not knocked off, loose...NO NOZZLE!! The stuff I was sent says 'spray' underneath the word 'writer'. So I guess since I did not recieve what I ordered, I cannot properly write a review. This site has great stuff and I hate writing a bad review...but they need to get back in shape. I ordered plenty 2 years ago, was very happy. Now not so much. I'm so sorry to hear that this happened! Did you reach out to Customer Service at all? They will be happy to fix this for you!